We’d love your help. Let us know what’s wrong with this preview of Oz by Eric Shanower. To ask other readers questions about Oz, please sign up. The Wizard and Dorothy are together again! As the title clearly states, the two most famous characters from the first book are together again. Dorothy and the Wizard reunites! And you can bet that new companions rise. Zeb, that he's Dorothy's cousin. Jim, a work horse. And Eureka, a mischief cat. As happened with Billina in the previous book, the horse and the cat can The Wizard and Dorothy are together again! The bunch are lost yet again in fairy terra incognita, far from the familiar territory of Oz. Good thing that Dorothy and her friends soon enough have the support of the Wizard! They will have to face in the strange land of the Mangaboos and the odd valley of Voe, but you can bet that a visit to Emerald City in Oz is not so farfetched to hope. The journey is entertained, full of humor, with plenty of perils and indeed one heck of adventure! The wonderful Oz-esome team of Eric Shanower and Scottie Young is together again to adapt the fourth book of L. Frank Baum. Cute, but overall lacking in substance. 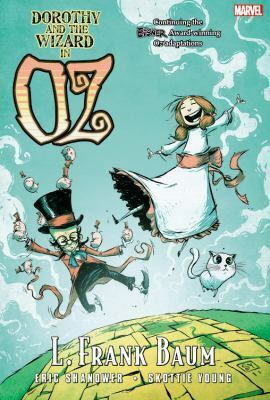 This graphic adaptation, by Eric Shanower and Skottie Young, of the fourth book in L. Frank Baum's Oz series is outstanding. The storytelling, dialogue, and artwork are all wonderful and faithful to the original novel, and Shanower's introduction is enlightening. This is a fun series that will be enjoyed by all ages. Wow, almost non-stop action in this one. The series continues to be outstanding with the same team behind it. I'm not optimistically hoping they will be able to finish out the whole oz series together. I really appreciate Shannower's introductions. They usually give a good bit of history on Oz, and this book gave some really good input on some of the oddities in the book originally, and how he tweaked the story to try and fix them. I know the return of the Wizard to the series feels like a big thing, and he does hog a lot of the spot lig The series continues to be outstanding with the same team behind it. I'm not optimistically hoping they will be able to finish out the whole oz series together. These Oz graphic novels continue to surpass my expectations. The storyline and dialogue are almost word-for-word from the novels, and the beautiful illustrations only enhance the fun. As with book #2, this one gets 4 stars only because the Oz book itself is a little weak. I really enjoy Eric Shanower's introductions at the beginning of each book. They reveal a lot of what was going on in L. Frank Baum's world and why certain decisions were made in the stories. It adds a lot to the reading, and I r These Oz graphic novels continue to surpass my expectations. The storyline and dialogue are almost word-for-word from the novels, and the beautiful illustrations only enhance the fun. I really enjoy Eric Shanower's introductions at the beginning of each book. They reveal a lot of what was going on in L. Frank Baum's world and why certain decisions were made in the stories. It adds a lot to the reading, and I really appreciate that he includes them. Thankfully the same talent (writer, artist, and colorist) are committed to continue adapting the further adventures of the world of Oz. I've thoroughly enjoyed every adventure they've adapted and this story is unique because it brings all the current and past cast of characters together. I didn't hate this, but I didn't like it either. I found the story boring and I had to keep re-reading pages because I was skim reading. I'm really disappointed as I really wanted to like this. Dorothy once again visits the land of Oz, this time accompanied by her cousin, when they fall through a crevice that opens up due to a horrible earthquake. Once they reach the bottom, they meet a plant-people, the Mangaboos, who live in a self-repairing glass city. Because Dorothy & Zeb are meat-based life forms, the citizens have decreed they must be put to death. The Wizard arrives in a timely fashion to prevent their deaths, having drifted down in his hot air balloon through a similar cra Dorothy once again visits the land of Oz, this time accompanied by her cousin, when they fall through a crevice that opens up due to a horrible earthquake. Once they reach the bottom, they meet a plant-people, the Mangaboos, who live in a self-repairing glass city. Because Dorothy & Zeb are meat-based life forms, the citizens have decreed they must be put to death. The Wizard arrives in a timely fashion to prevent their deaths, having drifted down in his hot air balloon through a similar crack in the earth. After escaping the Mangaboos, the group must evade the invisible bears in the Valley of Voe, ascend the Pyramid Mountain, escape the wooden gargoyles and baby dragons before finally being rescued by Ozma with the use of the Nome King's magic belt. Dorothy reunites with all her old friends from the previous books and enjoys her time in Oz. When she discovers that her Aunt & Uncle are mourning her death, she has Ozma send her and Zeb back home. Great adaptation of Baum's fourth Oz book. It has been a while since I read the original, but from what I remember, this sticks closely to the original book with a few minor changes which are noted in the beginning of this book. I actually liked this version better than the original. I think the graphic novel format works very well for this story. Baum's descriptions were often a bit vague and/or confusing, but seeing Skottie Young's versions of the various creatures Dorothy and her companions meet on their journey is breathtaking. Wonderful, fantastic artwork. I love his style. This really brings that story to life. I find it best to read the original and then read these graphic novels, but for people who don't like reading novels or don't enjoy Baum's style yet want to know the Oz stories, this is a great route. These books take the original story and put it in a graphic novel format instead of retelling the story entirely. They can be used in hand with or as an alternative to the originals for people who prefer graphic novel format. This is the fourth book in the graphic novelization of the Oz books by L. Frank Baum. I enjoyed this book a lot, the art by Skottie Young was amazing, like always. My issues lied with the animal companions, Jim and Eureka, in this story. But this is really a character issue, both came off as rude or very angry. I didn't enjoy the attitude either character held towards other characters in Oz, but I understand that this is part of the book. Not complaining, merely stating. I would have liked my more This is the fourth book in the graphic novelization of the Oz books by L. Frank Baum. I enjoyed this book a lot, the art by Skottie Young was amazing, like always. I'm not going to say in every review that I didn't like the art, so I'll just skip over that. I think that the story was followed pretty well. I did enjoy how the vegetable people were portrayed. Something I have liked in this series is the depiction of Ozma as a brunette. I know Baum had her originally done up as a blonde, but I like her darker hair. A young girl and her companions fall through a crack in the Earth's surface and find themselves in a strange land. I thought the graphics were really good (in particular the animals) but the story was a bit patchy. Me gustan los libros ilustrados que tienen una historia completa (no quedan en continuará). Los dibujos y las escenas son fantásticas. La trama es amena y divertida. Cute but unchallenging. Maybe should have strayed from the source material a bit more to better maintain pacing for a comic book. This was a return to the nearly perfect storytelling of the first in this series: the text was clever and precise and the illustrations were wonderful the entire way through. Perhaps my enjoyment was helped along by the fact that I remembered very little (if any) of the story. Is it possible that I'd somehow skipped reading this Oz book in all my years of loving Baum's works? This is Dorothy's third return to Oz and the first time the Wizard has appeared since his departure at the end of the fir This was a return to the nearly perfect storytelling of the first in this series: the text was clever and precise and the illustrations were wonderful the entire way through. Perhaps my enjoyment was helped along by the fact that I remembered very little (if any) of the story. Is it possible that I'd somehow skipped reading this Oz book in all my years of loving Baum's works? This is Dorothy's third return to Oz and the first time the Wizard has appeared since his departure at the end of the first book. It also introduces some new characters, some more memorable than others. Jim the aging former racehorse-turned-cabhorse-turned-carthorse was perhaps my favorite, with his curmudgeonly temper and wounded pride. Dorothy's cousin Zeb adds little to the story; although I've just finished reading, I can't think of any moments where he significantly added to the plot or to any of their narrow escapes. Perhaps Baum simply felt he needed another human to marvel at the wonders of the fairylands they encountered. (Dorothy and the Wizard are old hats at this sort of thing now, and little truly fazes them.) Then there's Dorothy's Toto-substitute, Eureka, who's put on trial for attempting to eat one of the Wizard's nine tiny pigs and proves exactly how heartless kittens can be. Shanower notes in his introduction that he fixed a dangling plot element in Baum's original story: namely, Dorothy's belated realization that Ozma could easily whisk them out of danger with her Magic Belt. I'll have to read the novel itself to see what adjustments were made, but Shanower's version was clear and logical. The only piece that stood out to me is probably another dropped thread from Baum (rather than from the adaptation). The nine tiny pigs speak throughout the story, often reprimanding the kitten for threatening to eat them when she'd just acted like their friend by playing with them, yet the Wizard's trick at the end relies on the tiny pig not speaking for itself. Did Baum forget he'd given them the power of speech that all Earth animals achieve in fairylands? Or did he simply prefer to leave the pig silent so Eureka could have the final speech? This is the first Oz book in the Marvel Oz series that I haven't read the original version. Shanower does a good job in the intro telling the reader exactly where he made adaptations and why. If you aren't familiar with this Oz adventure, Dorothy has just come back from Australia and is visiting cousins in the San Francisco area when the huge earthquake hits. Dorothy, her cat Eureka, Dorothy's second cousin Zeb, and Zeb's horse Jim fall into a crevice in the earth and find themselves in some ver This is the first Oz book in the Marvel Oz series that I haven't read the original version. Shanower does a good job in the intro telling the reader exactly where he made adaptations and why. If you aren't familiar with this Oz adventure, Dorothy has just come back from Australia and is visiting cousins in the San Francisco area when the huge earthquake hits. Dorothy, her cat Eureka, Dorothy's second cousin Zeb, and Zeb's horse Jim fall into a crevice in the earth and find themselves in some very strange places in the deeper parts of the earth. And the animals suddenly find they can talk. Pretty soon after their adventure starts, the Wizard of Oz also joins them as he's fallen into a crevice during the earthquake as well. The three of them go from one dangerous place to another trying to get back to the surface of the Earth. Eventually they are stuck, but Ozma and the Nome King's belt come in to save the day and whisk them over to Oz for a grand reunion with all Dorothy's friends, some trouble for Eureka, humble pie for Jim, and then everyone goes home. I personally enjoyed this book mostly because of Eureka. She is a spunky, stuck up cat, illustrated gloriously and hilariously by Young. She stole the show. Jim the horse has his moments too. Again, the graphic novel format just makes these books better. Baum had a tendency to insert these groan-worthy puns into the conversations, and the graphic novel format makes them a little more bearable (mostly because of the faces Young gives the characters at these points). Having now read 4 of the 5 Oz books adapted by Eric Shanower and Skottie Young, I think the whimsy might be wearing on me a little bit. I mean, I love whimsy. Come on. I love fantasy, too. But the books have progressively moved further and further away from having any real plot or stakes. Granted this is adapted from a book written for children 105 years ago, but I think it shows that L. Frank Baum was kind of running out of ideas at this point. The vast majority of the book does not actually tak Having now read 4 of the 5 Oz books adapted by Eric Shanower and Skottie Young, I think the whimsy might be wearing on me a little bit. I mean, I love whimsy. Come on. I love fantasy, too. But the books have progressively moved further and further away from having any real plot or stakes. Granted this is adapted from a book written for children 105 years ago, but I think it shows that L. Frank Baum was kind of running out of ideas at this point. The vast majority of the book does not actually take place in Oz, as the title would suggest. Instead, Dorothy, the Wizard and their companions get swallowed up by an earthquake and have to journey their way out of the strange lands they find at the center of the earth. The most I can say about these lands is, they're interesting. Each land could've had a longer story devoted to it. Instead we just get brief glimpses of the lands before our heroes practically run out of them to get to the next thing. Villains and stakes are set up and then abandoned over and over again. There is practically no plot, and no reason to care about the characters. It's just "look at this weird monster" without any real substance. Also, in this volume Baum uses one of the most blatant, laziest deus ex machinas I've ever seen. It completely removes any feeling of danger or importance in any single thing done by any character, then just tosses us into a feeling of safety that never goes away. It's very strange. This is the fourth book in the Marvel’s Oz comics. This was a great installment in this series, it wasn’t as good as Ozma of Oz, but it was still very entertaining. This time Dorothy, her cousin Zeb, and her cat Eureka are swallowed by an earthquake. They end up as prisoners of the Magnaboos and run into the Wizard of Oz who helps them escapte. They end up fleeing across the Invisible Valley. Eventually they end up back in the Emerald City where all of our favorites are in residence. My favorite This is the fourth book in the Marvel’s Oz comics. This was a great installment in this series, it wasn’t as good as Ozma of Oz, but it was still very entertaining. My favorite part of these books continues to be the fantastic illustration throughout. I just feel like Young’s illustration style matched the tone of these stories absolutely perfectly. I missed some of my favorite characters in this book. We don’t see much of Ozma or the Tik Tok Man. Most of our time is spent with Zeb, his horse, the Wizard of Oz and Dorothy. The Wizard of Oz isn’t my favorite character either, so I didn’t enjoy reading about him as much as other characters in the series. I really did enjoy Zeb’s horse though, he is hilarious throughout. I LOVE this series! I sincerely hope the entire team behind these great books stays together to bring this series to its completion. In this volume Dorothy and her cousin Zeb fall deep into the Earth after an earthquake cause the surface to fissure. The Wizard turns up again in this volume and is as big a humbug as he ever was, though his tricks do help Dorthy and company escape some tough situations. This time around Dorothy and friends cross paths with the Mangaboos (strange vegetable creature I LOVE this series! I sincerely hope the entire team behind these great books stays together to bring this series to its completion. In this volume Dorothy and her cousin Zeb fall deep into the Earth after an earthquake cause the surface to fissure. The Wizard turns up again in this volume and is as big a humbug as he ever was, though his tricks do help Dorthy and company escape some tough situations. This time around Dorothy and friends cross paths with the Mangaboos (strange vegetable creatures that live in a glass city), visit a beautiful land where all of the residents and predators (bears) are invisible due to the effects of eating a delicious fruit, duel flying wooden gargoyles, escape hungry baby dragons, and make their way back to Oz (with Ozma's help) where the trial of Eureka is held to find out whether she ate one of the Wizard's piglets that was destined to be Ozma's new pet. I really appreciate the introduction Shanower provides as they help set the tone for the story by revealing what was going on in Baum's world as he was writing the story and the public reception to his work. In this volume, Shanower admits to improving some of the pacing in regards to Dorothy's ability to summon Ozma for help and I liked knowing that going in and it also made sense in terms of telling the best story possible. I'm puzzled by other reviews. This book title and cover match what I read, but my book is a spin-off series from Shanower's original Oz graphic novels, the Wonderful Wizard of Oz. This new series is called Dorothy and the Wizard in Oz and my book spine says Vol. 1. Also, the version I read does not have any introduction by Shanower that other reviewers have mentioned. How disappointing! I would have loved to read that. Back to the book...I enjoyed reading this, even though I haven't read the earli I'm puzzled by other reviews. This book title and cover match what I read, but my book is a spin-off series from Shanower's original Oz graphic novels, the Wonderful Wizard of Oz. This new series is called Dorothy and the Wizard in Oz and my book spine says Vol. 1. Back to the book...I enjoyed reading this, even though I haven't read the earlier series. It was a fun start to a new series that made me laugh in places. For example, the horse is upset because he's hungry and Zeb tries to dismiss his concerns, so the horse says, "Nothing is more dangerous than being without food!" - Dorothy and the wizard are back! No Toto still, but Dorothy brings a cat. Dorothy has a lot of pets. How come the chicken and the cat can talk but Toto doesn't? - Frank L. Baum had an extraordinary imagination. Each book is more bizarre than the last. Dorothy and her companions visit some very strange places in this story. - Tim Burton should make movies out of all the Oz books. They are right up his alley, and they would be creepy, weird, and awesome! - The cat is very onry. I wish it had been m - Dorothy and the wizard are back! No Toto still, but Dorothy brings a cat. Dorothy has a lot of pets. How come the chicken and the cat can talk but Toto doesn't? - The cat is very onry. I wish it had been more of a playful cat.